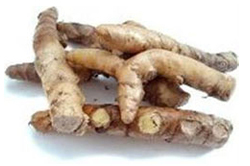 You are at:Home»Herbs»Curcuma zerumbet Roxb. Latin name : Curcuma zerumbet Roxb. Description : It is often confused with round zedoary. The rhizome is demulcent, diuretic, expectorant, stimulant, stomachic, antiallergic, antiinflammatory, antipyretic, aphrodisiac,carminative and aromatic, tonic. Useful in lack of appetite, flatulence and dyspepsia, and as a corrector of purgatives. It is also used in cases of irritation of the fauces and upper part of the windpipe, cough and bronchitis. Also checks leucorrhoeal and gonorrhoeal discharges and chronic diseases caused by impure or deranged blood. Externally, the root is ground and applied to rheumatism, sprains and bruises. Contraindication : Women who experience heavy menstrual flow should avoid taking large dosages.